Please take care of your trip to Shimoda. 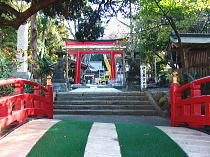 First of all you find out Shirahama shrine on Road #135. 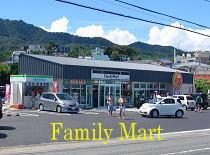 Convenience store "Family Mart"after that. After that you find out the sign #19. 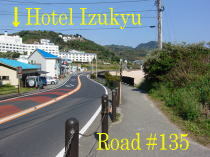 You find out Surf Shop and Hotel Izukyu on the left side. 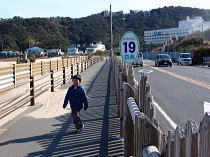 This is the entrance of street to Pension Sakuraya from Road #135 in front of Shirahama beach. There is a sign says "Pension Sakuraya". Go up the hill about 150 meters to the 1st fork from here. Go straight to the middle of this fork. There is a 2nd signboard at this fork. It's only 100 meters from here to get to Sakuraya. Yes, that's your today's hotel. Thank you for coming to our Pension. You can see the ocean and Izu Oshima island from here. Please make your self relaxed and at home. Thank you !